Its our last day in the Chinese capital so although I fancy a lie in we’re up for a final sightseeing day. 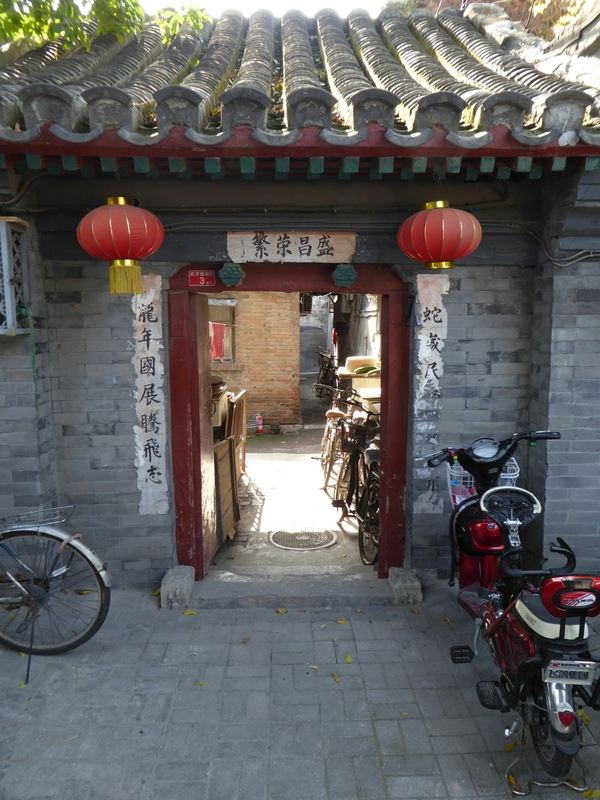 We start at the Shija Hutong Museum which we have to travel about 100 metres to, cos we’re staying on Shija Hutong. 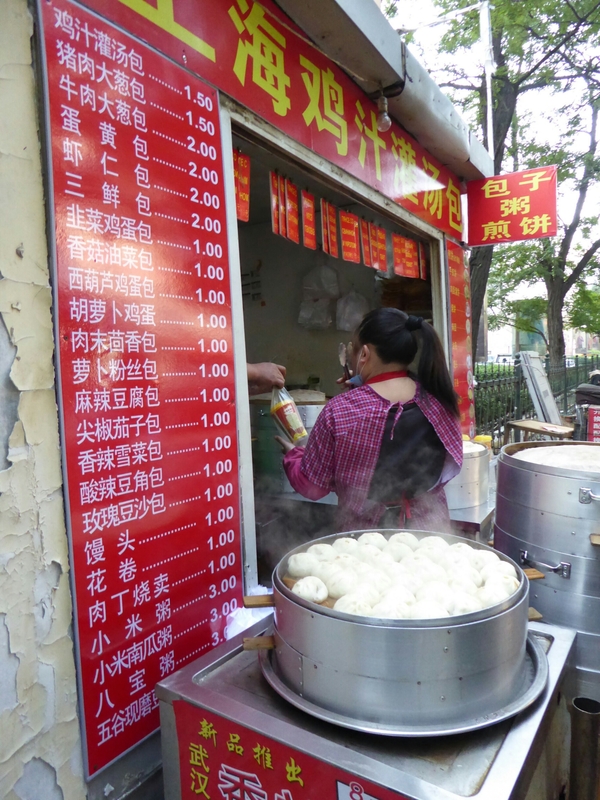 Hutongs are residential alleyways, usually single storey where to indulge in very good people watching means dodging stealthily silent electric scooters and bicycles. 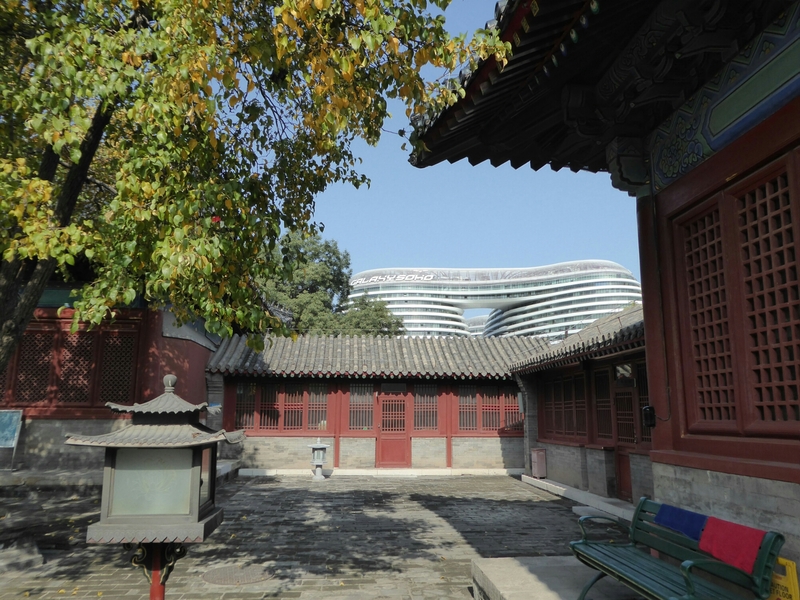 Its a local history museum with information on the origin and design of hutongs, famous folk who have lived on Shija and old artifacts. I love the black and white pictures of everyday life in the 50s. Breakfast next and we shun 7/11 onigiri for fresh Chinese steamed buns. Cornflour with veg and herb and wheatflour with meat. 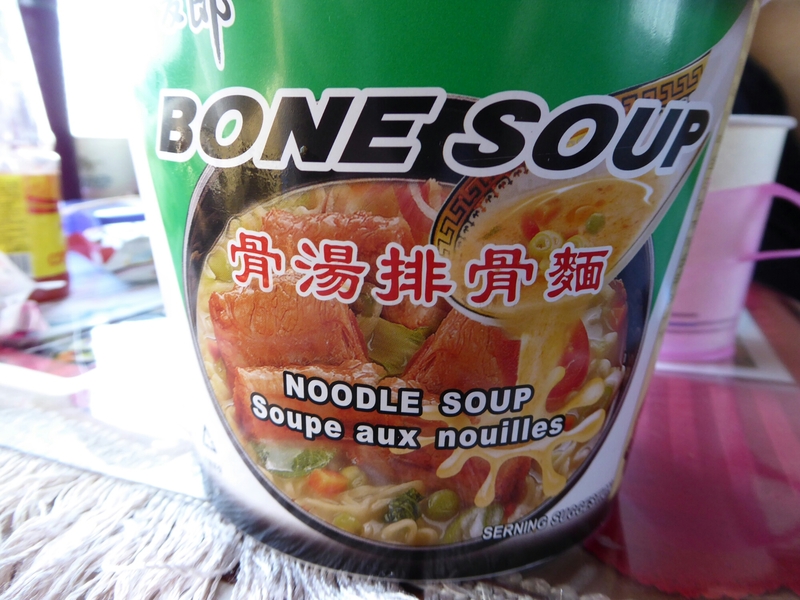 The sellers ask us stuff and we shrug like guilty Italian footballers and point and we all laugh and we say thanks in Chinese. Buddhist temple next. On Monday it was closed, today its free. A security guard points us to a sleeping pensioner who opens his eyes, gives us a ticket and closes his eyes. There’s a brief English explanation and photos from the 30s of a delapidated temple which is not the renovated one we see but the interiors are old and dusty and there are few folk here so the atmosphere is nice. Ritan park next, where we sit in front of the colourful plant beds and indulge in the steamed buns we just bought from the busy market down the road. A shouty lady performed a miraculous job of fulfilling peoples orders from towers of steamers. We got tofu and meat. Meat was tasty, sweet and juicy, as my jacket and trousers show. It is possibly my favourite temple so far as it is so different. 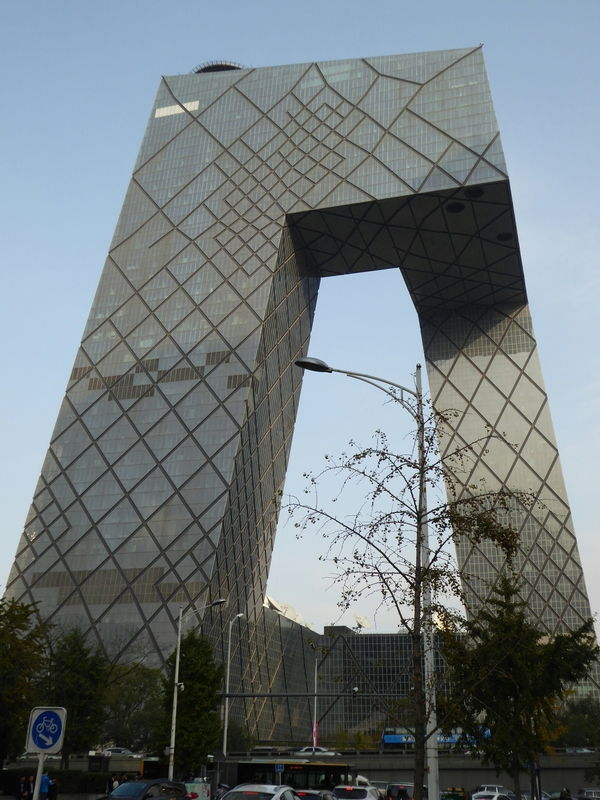 Leaving Taoism with many questions we walk through the much taller CBD, dodging jeeps and porsches and range rovers to see the gravity defying CCTV building or big pants as the locals know it. Tonight we have a dinner date with Alison’s Aunt’s English student (please use your own grammar and translation) so we lurk outside a metro station. 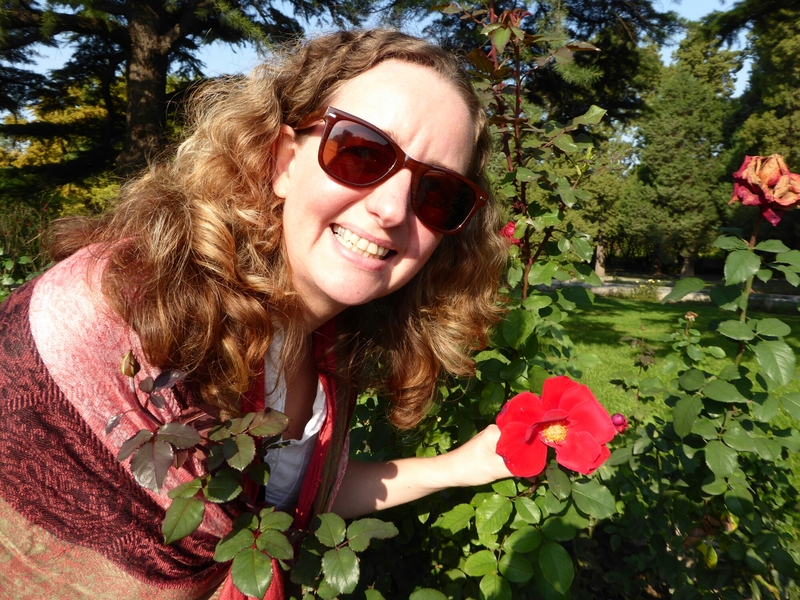 Sue is bubbly and engaging and we chat and head to Qianhai lake which has serene drooping willow trees and a skirt of neon and happy locals. 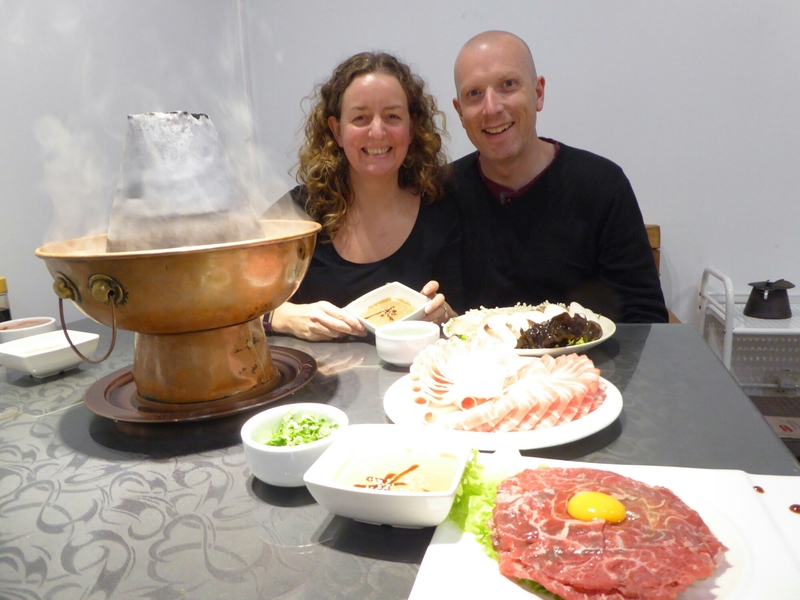 We agree on hot pot and she leads us to a busy restaurant where we are pleased to let her communicate with the busy staff and order a traditional meal. The hotpot arrives which is a copper cone full of burning charcoal with a trough of water on the outside, which the attentive waitresses keep filling from huge copper kettles. The food arrives, wafer thin mutton, thicker beef, mushrooms, shrimp balls, cabbage, lotus root, fried tofu sheets, spinach. 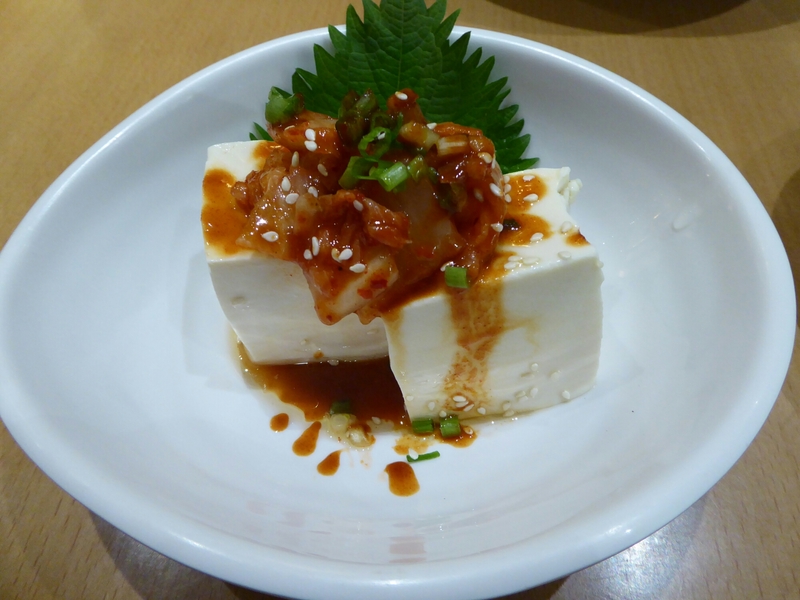 Each is submerged in the boiling water and left to cook before being fished out, dunked in sesame sauce and enjoyed. The heat from the hotpot is subdued with cold Chinese lager and our first taste of Baiju, the Chinese fire water. Full, we circumnavigate the lake, taking in the sights and chatting and learning from Sue about Chinese culture. We say our farewells at the tube and head home via our local shop for a tiny bottle of baiju. 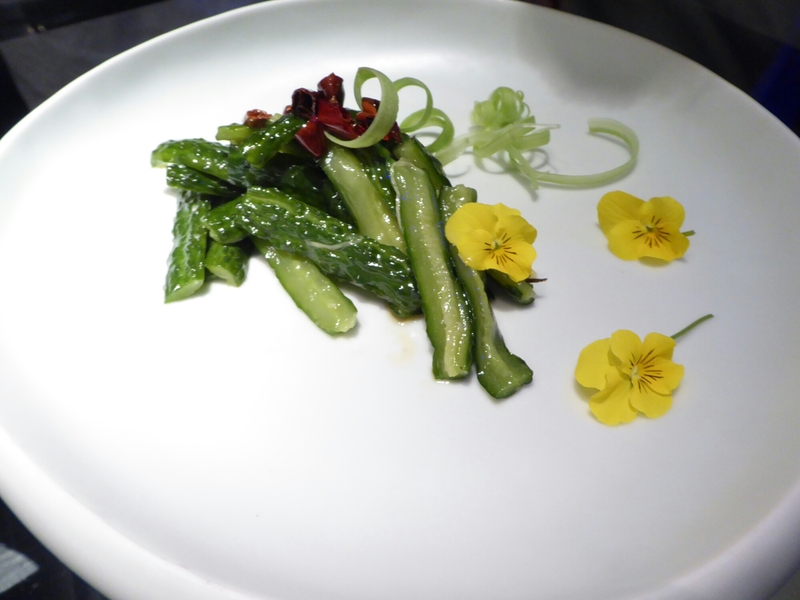 For the little its worth, probably my favourite day in Beijing. After yesterdays planning session we decide to go to the train station and book our own trains!! I was dreading it thinking it would be a mare but it was dead simple, there was an English speaking booth so we queued (after the obligatory security checks) and booked our 5 train tickets exactly as planned. I can’t say the people behind us were chuffed as it took about 15 mins to do them all. 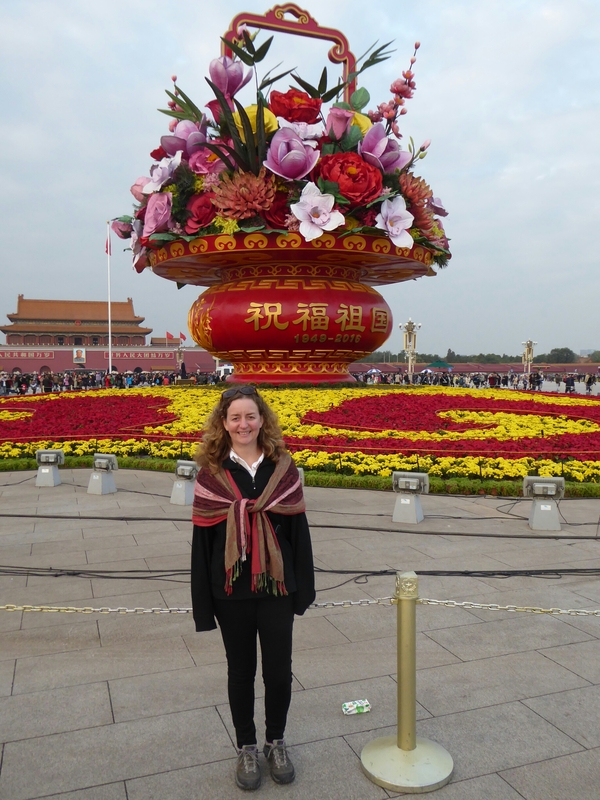 We were then on a mission to see some of the big sights here and so the Forbidden City was our choice for today. We queued again for the subway ticket, then again to get through the security checks to get in the subway, then to get on the train. 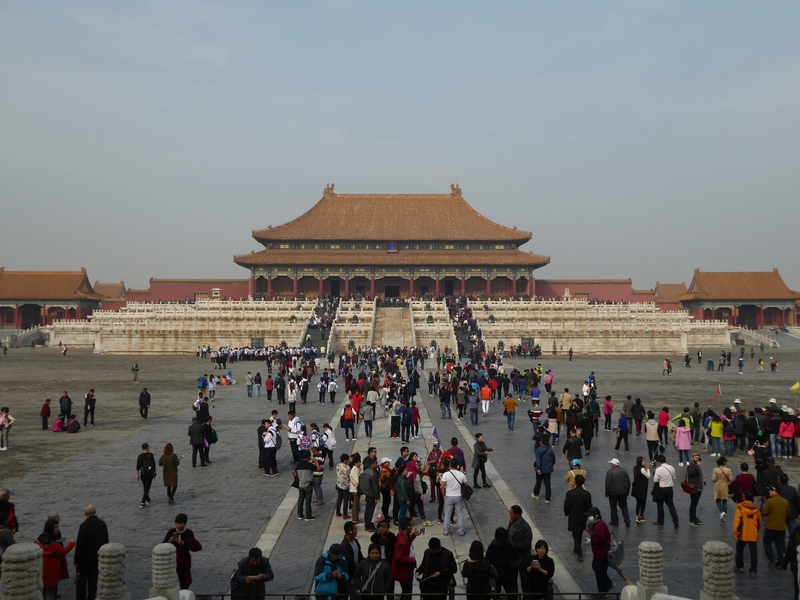 Once out we queued again (for ages in a long shuffling mass) to get into Tiananmen square, again to get into Forbidden Palace, then for tickets, then for another security check finally we got into the palace feeling slightly jaded but fully security checked! It was busy, full of Chinese tourists and kids in school trips. 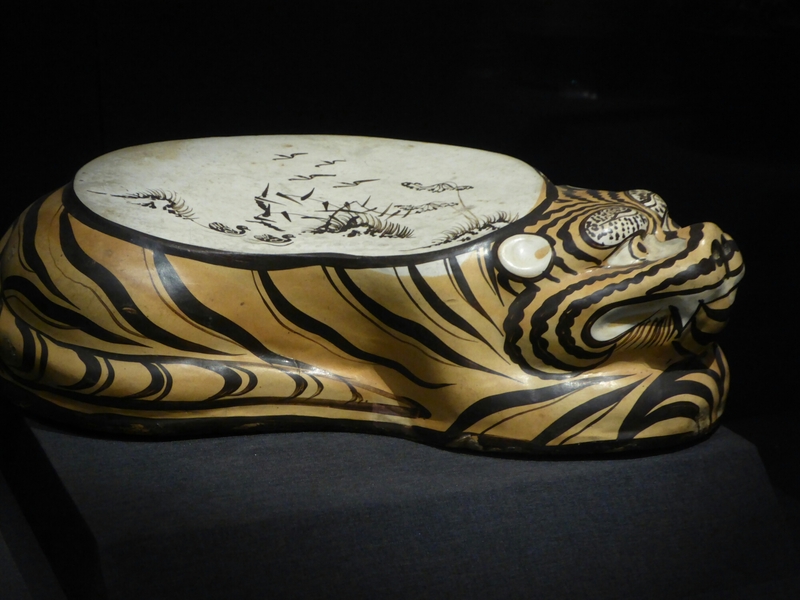 We saw the ceramic collection which had a tiger embossed ceramic pillow which caught my eye. We saw temples all in the same colours and styles as the previous days temples. It was underwhelming which surprised us. The jewellery exhibition was pretty stunning, as shown by everyone getting wonky photos of every piece on their phones. Yes, it was Guy that noticed all their photos were wonky!! We have a sausage snack whilst there, these sausages have never seen a pig in their life, Guy is impressed, me less so! 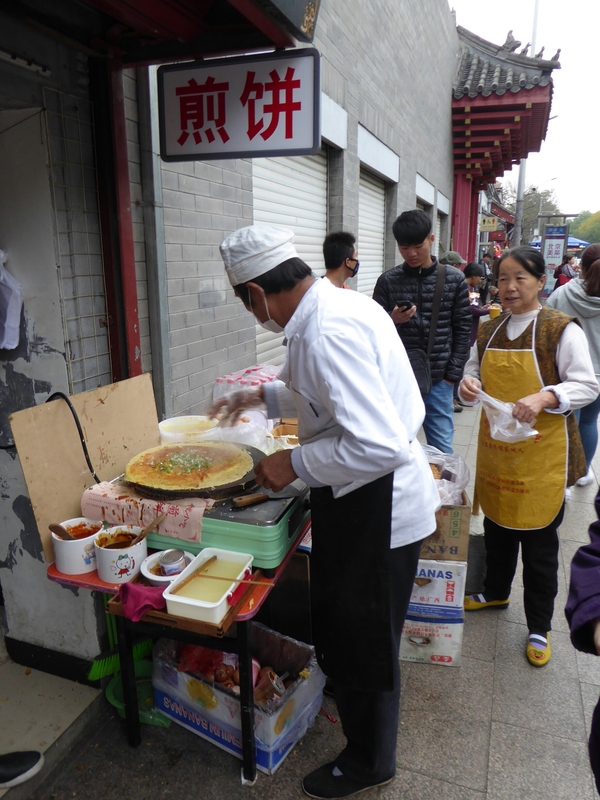 We wander out and down a hutong (street) we saw the other day, We remember a place that looked good to eat i.e. 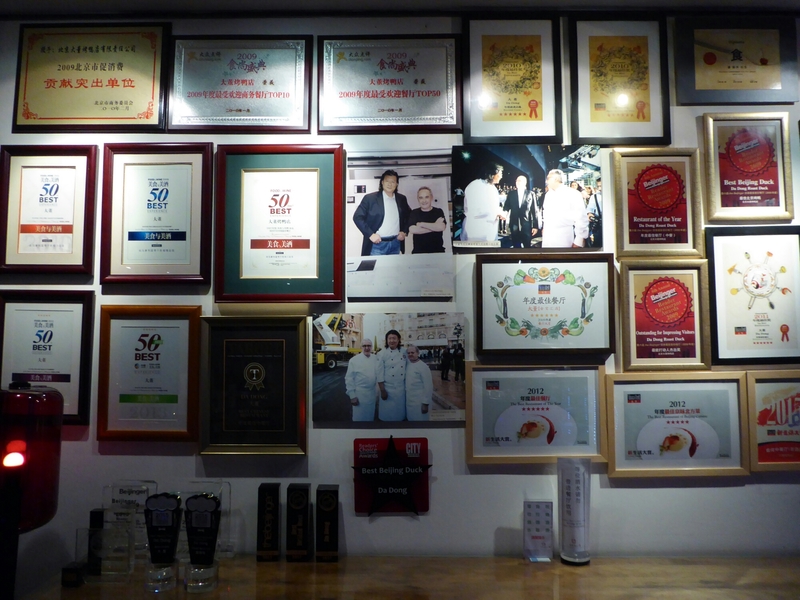 it had photos of the food on the wall and it looked clean. 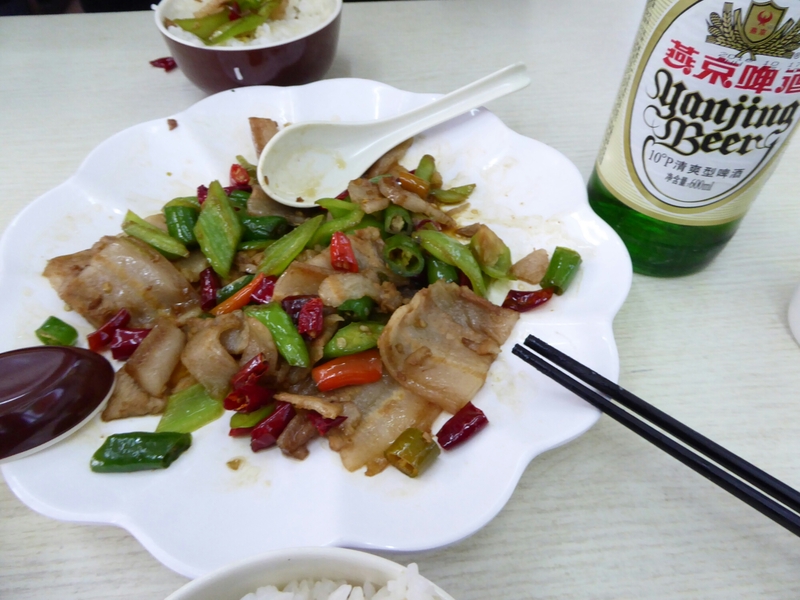 We go in beckoned by the cook and point at a picture of meat with peppers and green stuff. She promptly disappears and we hear the sound of what sounded like an aircraft starting up but it was just a massive gas burner and 5 mins later we have some soft belly pork stir fried with greens, peppers and some mighty hot chillies! Some other tourists look in and we say it is great whilst sweating mildly. They order the same dish and also sit there sweating. Beer is drunk to cool the chilli burn. We then try and make our way home, via a few dead ends and another sausage stand for Guy. 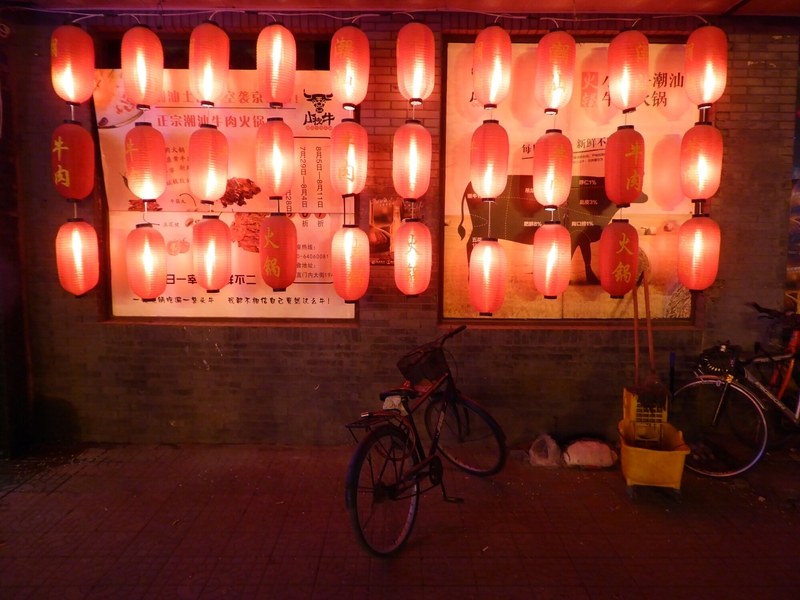 We wander down the Ghost Road, a plethora of seafood and hotpot restaurants with neon lights and red lanterns everywhere. We go back home past bicycle workshops, electrical repair shops, public loos (a lot), single room restaurants, shops, pastry sellers and food on a stick sellers. We pass a mutton restaurant which gives us Mongolian flashbacks and get home with a couple of beers to relax with. Reception confirm our fear that after Wednesday there is no room at the inn. There is so much to do in Beijing that we don’t have enough time to fit it all in and now we have to sort out what we’re doing next too which is slightly frustrating. This also shatters our illusion that we can travel in the same manner that we did in 1998, when we would arrive at a town, check the lonely planet for hostels and trawl round them till we found one we liked. Since then the internet has happened which is great for backpackers who can read reviews of places and great for hostel owners who can take advance bookings and keep a steady income but not great for impetuous backpackers who want to move spontaneously. Still change is inevitable and you must adapt or grumble. 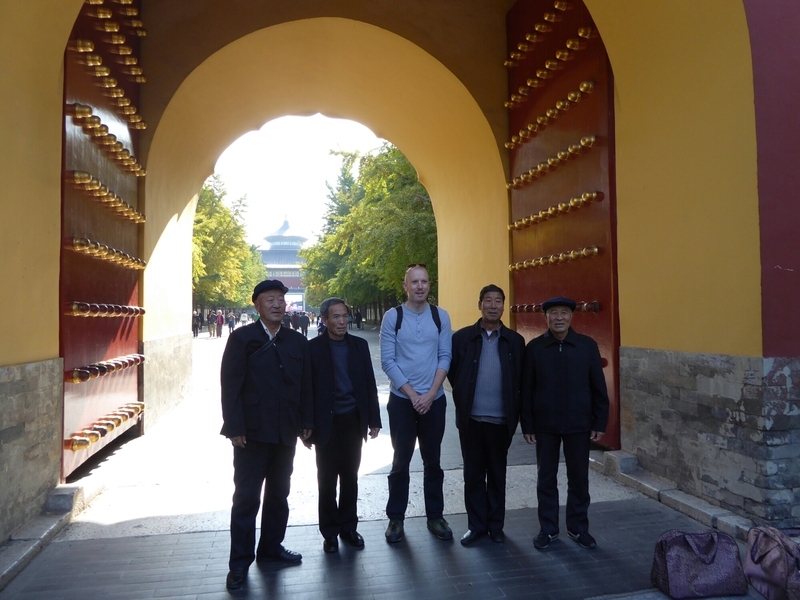 We head out under grey skies to the Lama Temple the largest working Buddhist temple in Beijing. 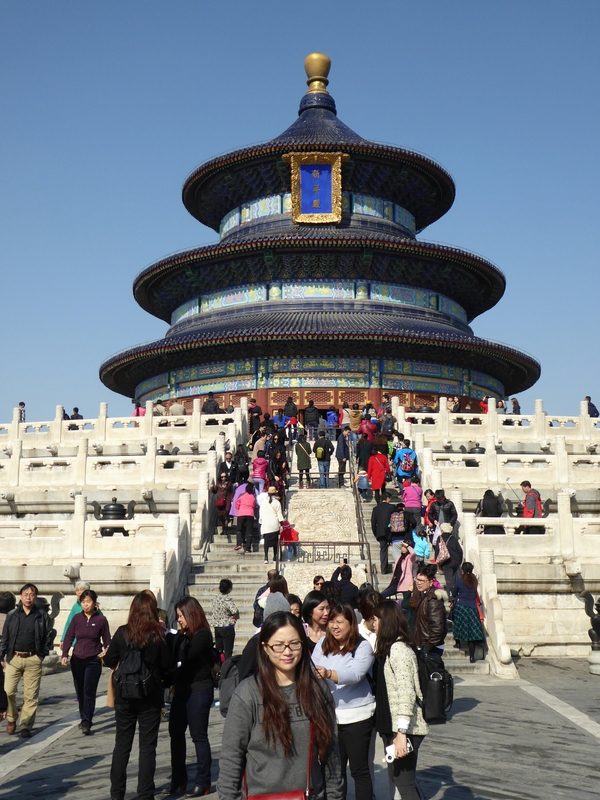 It is very busy with coach loads of tourists, western and Chinese, some of whom are pilgrims. 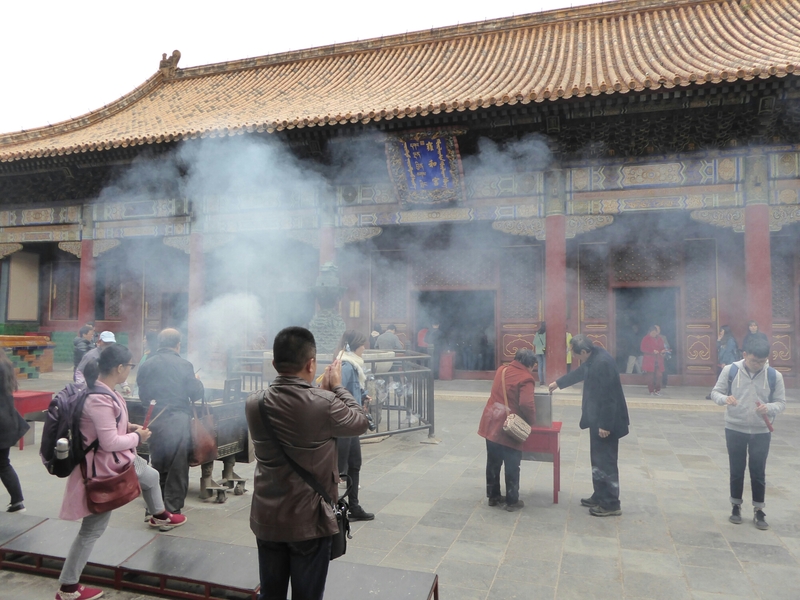 Before each temple is a kneeling pad for praying, a oil lamp for lighting incense sticks and a huge metal container emitting plumes of fragrant incense smoke. 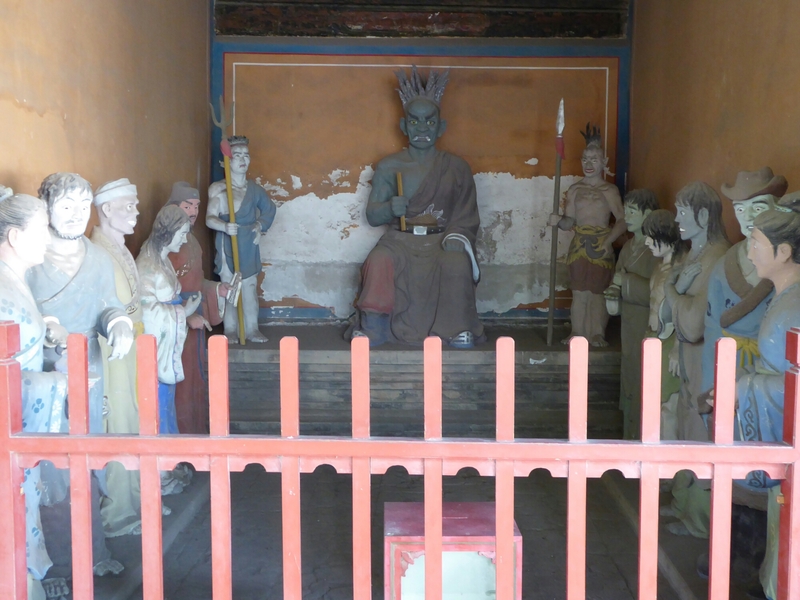 It is Tibetan Buddhist so there are statues and images of many deities alongside the Buddha statues in the dark, dusty temple halls. We respectfully wander about watching the locals pray in front of a specific deity as we had seen the Russians choose a specific saint. I leave with many questions. Half time on the temple tour, so a veg and fried tofu hot crepe please barman. 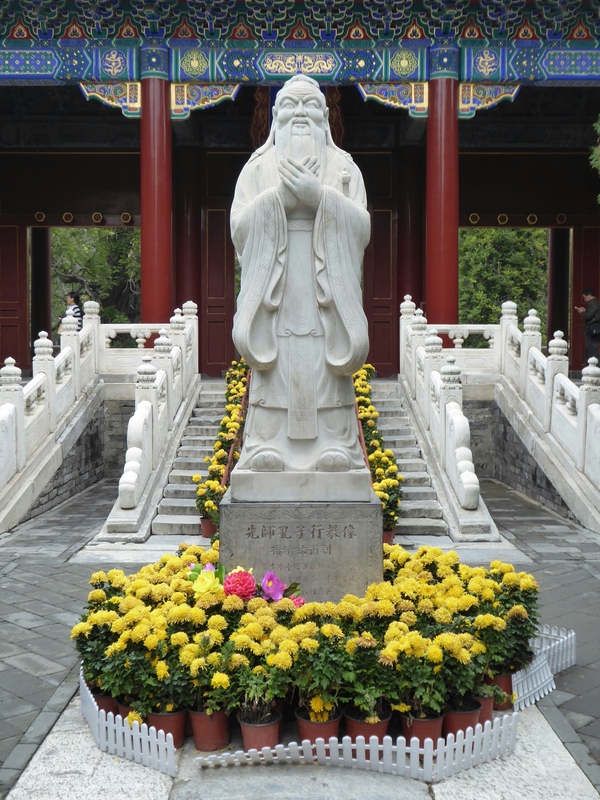 Round the corner to one of the most historic streets to see a Confucius temple. This is where the civil servants had to pass their exams during the Yuan, Ming and Wing dynasties. The contrast to the busy Buddha temple is noticeable and you can hear birdsong. On the outside both temples look very similar but the Confucius temple had very unusual items within the main temple and an interesting museum about his life. For the second time today I wonder what the man would have made of the ritual surrounding his celebration. 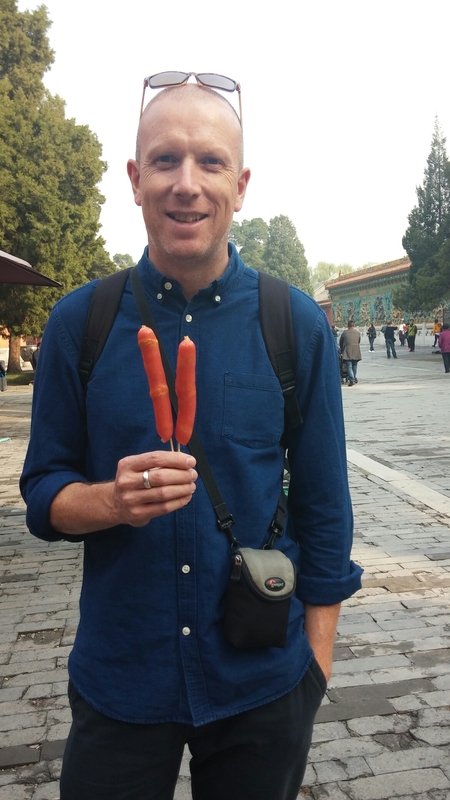 Down the wonderful single storey backstreets to the redeveloped square between the Bell and Drum tower where we start a hutong walk through fabulous scenes of life until we eventually reach Jingshan park and ascend steeply for views from the Buddhist temple over the forbidden city. The view would be awesome if not obscured by pollution but like the other tourists we can’t help snapping away. Back to the damp room to plan. Al checks trains and I book hostels. We need to book train tickets in the morning. We are less sprightly this among after last night’s ale crawl so plan to take it easy today! We check the map and bit seems to be a half hour walk to the Temple of Heaven park, and with the sunshine and blue skies it would be a shame to use the subway. We missed Seven Eleven on our walk and since we could find no where else to have coffee we went into another shopping plaza for food. 2 coffees and a blueberry muffin cost a third of our days budget but are sorely needed, it is 11.30am. Guy spots a noodle cafe and we decide to have early lunch (although as the locals eat at 11.30 then it is actually bang on time). 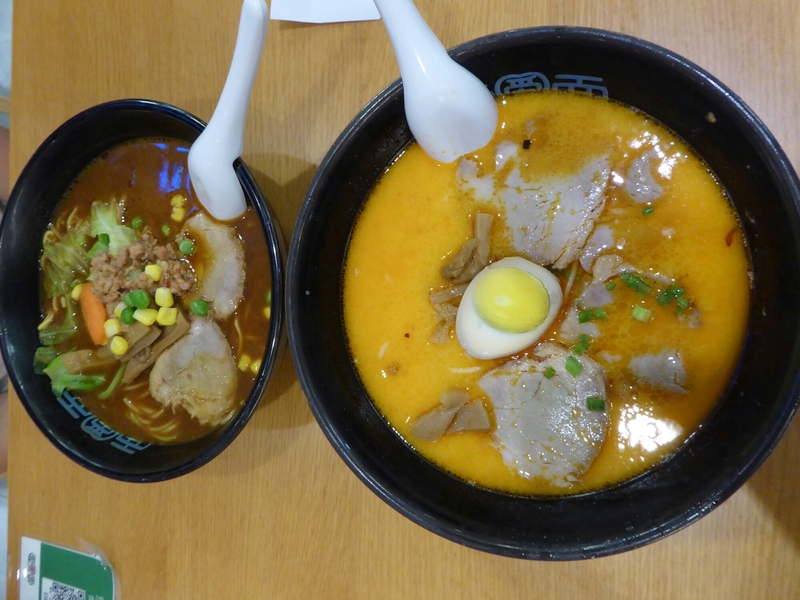 The soups are delicious, spicy and flavoursome just what we needed. Suitably restored we carry on walking to the Temple, we keep on walking for quite a few kilometres and down massive road until finally we get there, along with everyone else, or so it seems, as it is a Sunday afternoon and the sun is out so it is an obvious pastime. Guy gets accosted for a photograph on our way in, he duly obliges, no doubt this photo will be on someone’s mantelpiece soon. The temples are beautiful and so the Chinese are taking photos, lots of them, in all kinds of mad poses. It is fascinating people watching. 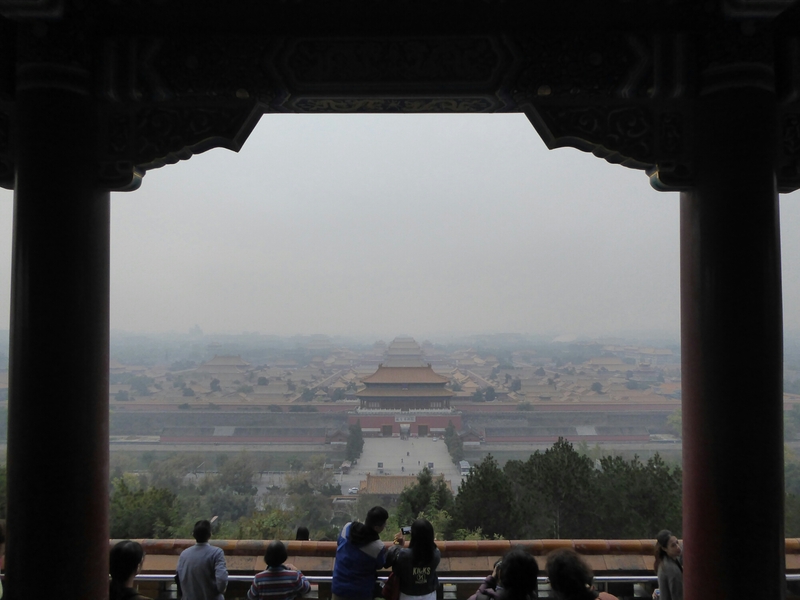 We go up to the main alter which has a view over Beijing, what is most striking is the smog, it is quite clear to see it hanging over the city. I have a green pea and mint ice cream which is lush and we walk though the Confucian designed forest to the rose garden for some more photographs in the style of a local. It is a lovely relaxing Sunday afternoon wandering around the park. We are leaving the park when we hear music and look over to see couples ballroom dancing in the park. Wonderful. We then decide to carry on walking to Tiananmen Square and pass some smiling drunk old fellas one of which had a small dog in his jacket. Emperor’s Walk to the square is chokka with locals, we wander down and when Guy is taking a leak (in one of the 1000’s of public loos here) I get asked for a photo, another mantelpiece adorned. 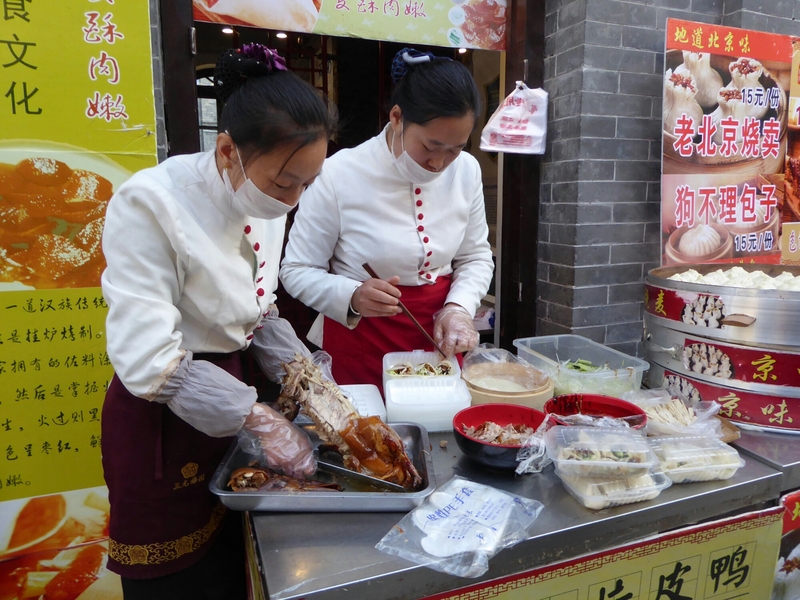 We needed food so dived down a side street and got some Peking duck rolls. 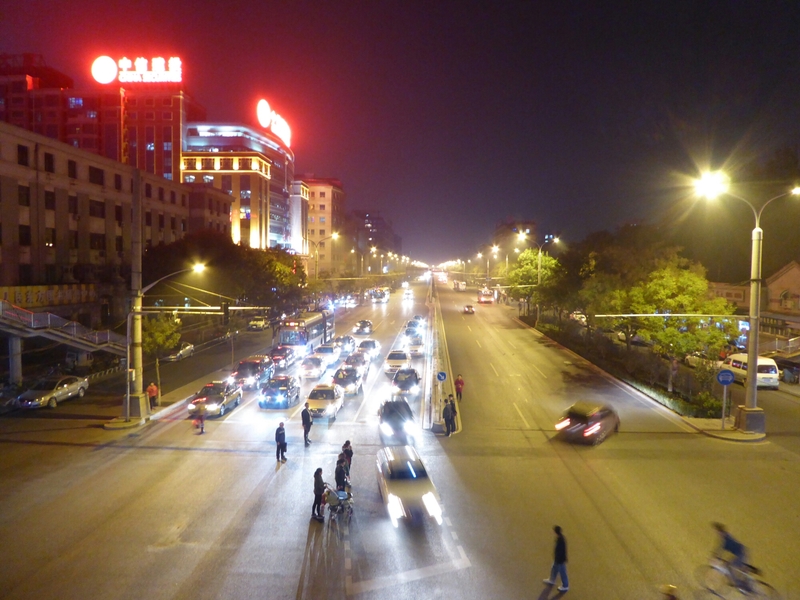 We then attempted to get into Tiananmen square, which wasn’t easy. We were funneled around, went through numerous queues and security checks and finally emerged into the massive oblong. Again, not a square however it is massively impressive especially with the Soviet style buildings around the outside as well. We wandered through, we slightly freaked out by the massive fake vase of flowers in the centre. Must be over 40ft high and is really surreal. 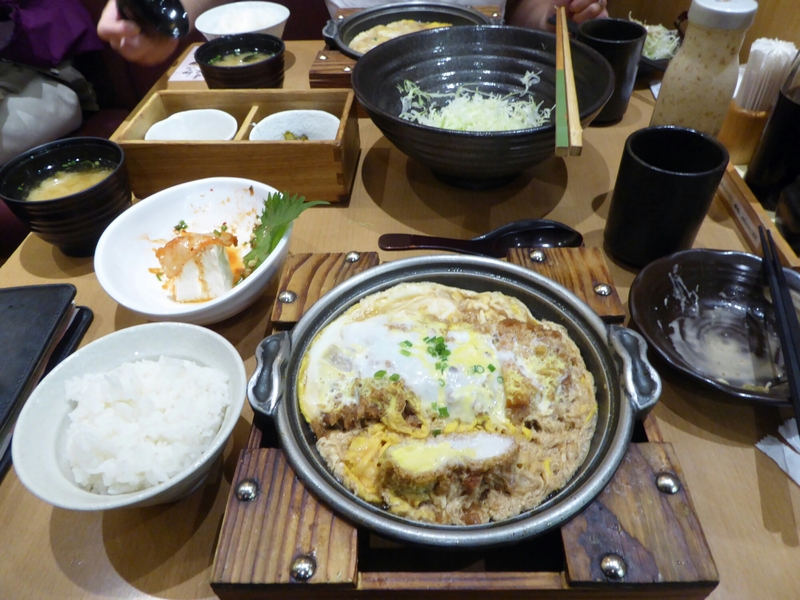 We left the square and took a backstreet to get back to ours, we were against the human traffic so had a Japanese meal at a food court. It was lush. The cabbage and miso dressing was particularly good. Woke up to sunshine and excited at the prospect of exploring a new Asian city. 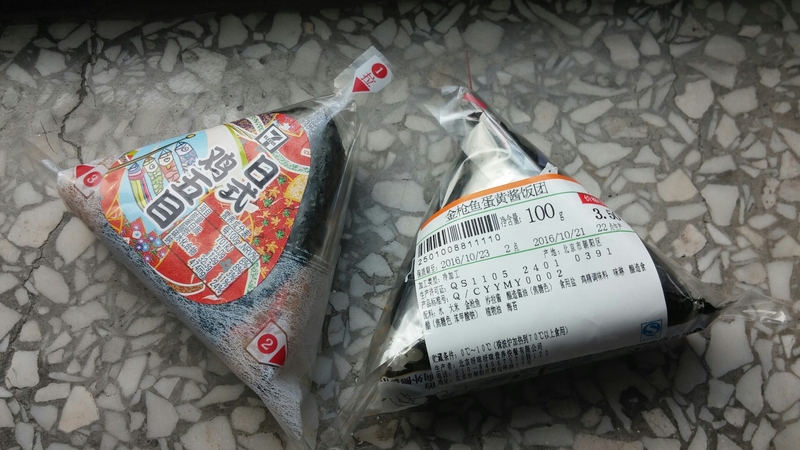 We wandered out and found Seven Eleven stores are here which is the best way to change your large notes in Asia and also an excellent place to purchase Magnums (in Bangkok) and here we found Japanese Onigiri, rice covered in nori sheets and filled with something surprising (to us at least as we cannot read the label). They also have a hot drinks shelf with a hot ginger drink so that was breakfast sorted, and there were some disused chairs outside so we used them as a breakfast bar. Delicious! We needed to buy deodorant, which seemed a simple task however Seven Eleven failed us, they only had Lynx which is not really unisex, so we carried onto the massive shopping street filled with shops, department stores and everything you could possibly require. It was 10.30 am. We entered a pharmacy but they had none. We tried a local shop but our mimes got us razors. We tried a supermarket but no joy. This was proving harder than we had anticipated. We found a humongous temple to consumerism called the APM mall and after the distractions of H&M, Zara, Gap et al we tried the big department store but couldn’t find any. The ladies on the information desk said they didn’t sell it. WHAT? 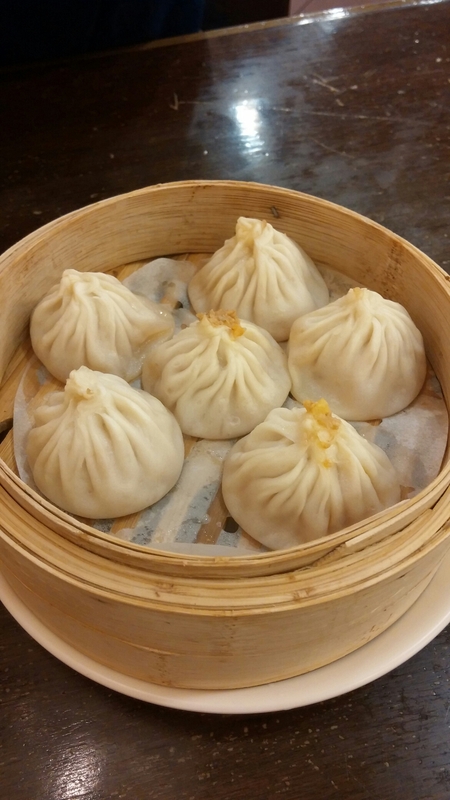 It was now lunchtime so we looked at the restaurant list in the mall and headed straight to the Shanghainese place. 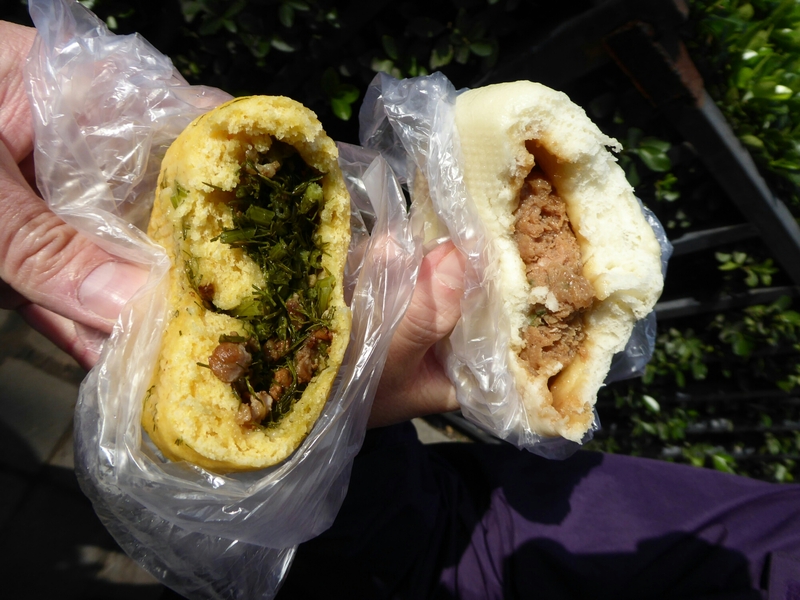 One of our favourite foods is Xialongbao, the delicious broth filled dumplings which are meaty, sweet and umami. Reinvigorated, we continued our quest for a small bottle with a ball. A Chinese pharmacy pointed us down the street. Another huge mall drew a blank. We found another supermarket and 4 assistants and a security guard using google translate and maps pointed us up the street. 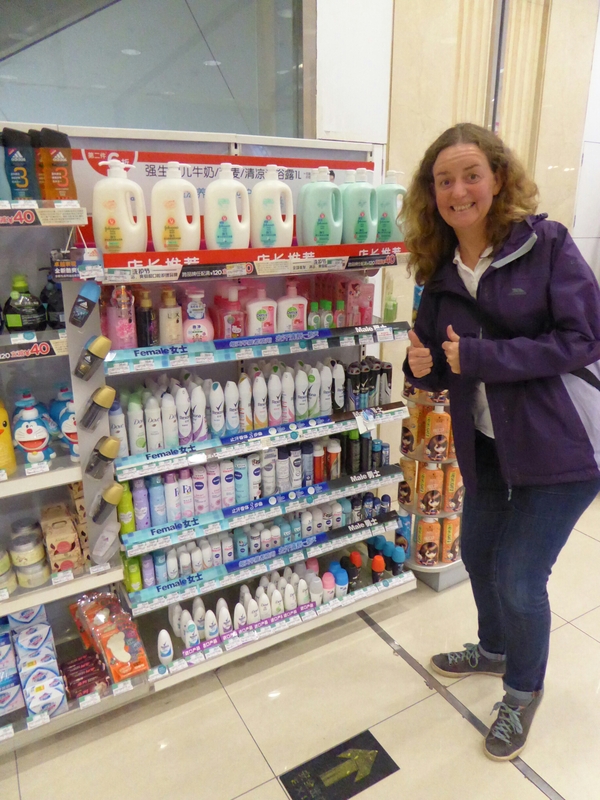 This was getting personal and although I didn’t shower for four days in Mongolia, I wanted, I needed, I craved deodorant. We tried another huge mall and in the basement was a huge supermarket and I’d have put our mortgage on finding deodorant there and I’d be on a flight home soon if I had. Tired and finding this situation slightly hysterical I mimed deodorant to a scary looking assistant. She didn’t point up or down the street, she pointed across the floor! OMG as a person younger than me might say. For the first time in my adult life I ran past the wine stall, we passed tea stalls, chocolate stalls and more tea stalls until we saw, and both audibly exclaimed ‘WATSONS’. In front of us was a pharmacy we had previously encountered in Malaysia. We’re not sure what the staff thought of our woohoo-ing, air punches or photos by the deodorant rack because sadly, our mandarin is terrible. It was 3.02. Our quest took 4.32 hours, and during it, we saw and could have purchased tripe in juice, rabbit in a cage, live scorpion on a stick, ice cream tea, scooters, all kinds of Chinese medicines, leather, silks, furs, chairman Mao plates, children’s panda outfits and felt shoes. We have since found out that Chinese people don’t need to wear deodorant due to their genes. I wish I had their genes. We went back to the hostel for a rest. 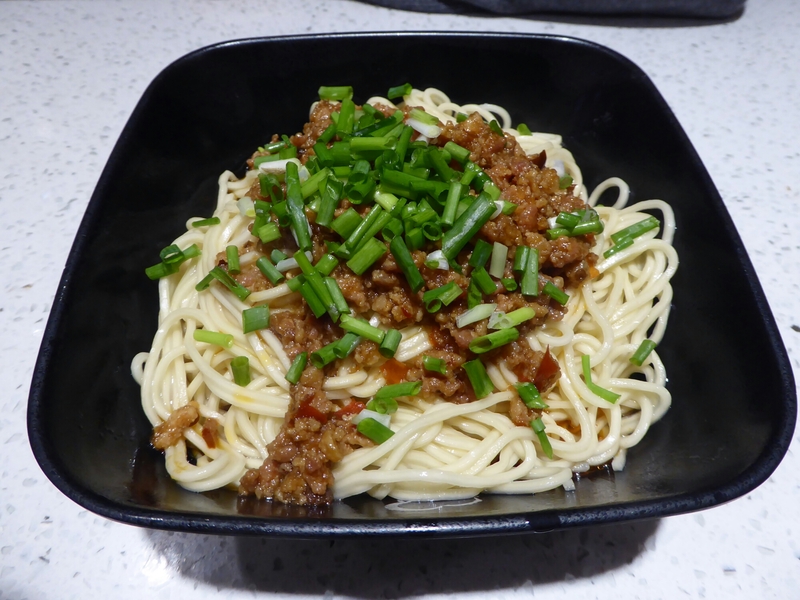 As it was Saturday we decided to see Beijing at play and wandered up to the main Hutong, or old street, which is full of shops and food and is supposed to be reminiscent of the old Beijing. 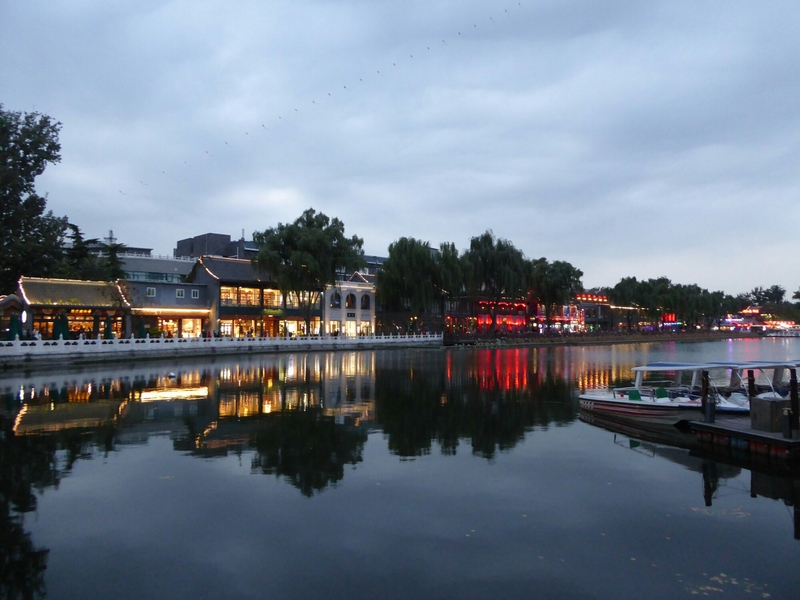 Like most things in Beijing it has been gentrified and knocked down and rebuilt with grey concrete and is full of natural health cosmetics, poncey shops and over priced food. Don’t get me wrong, it looks lovely and clean and everyone clearly loves it, if you just wander off down another street you can see how it actually was and still is today. 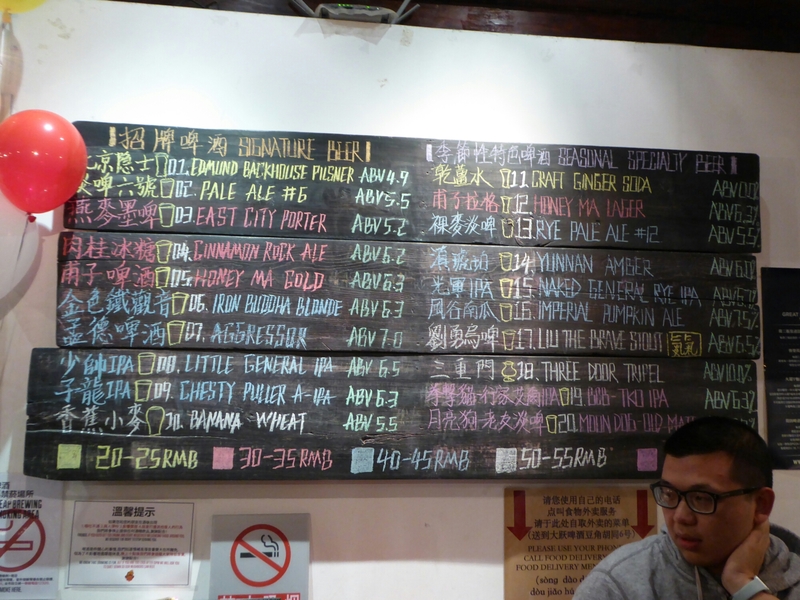 We did divert into a bar as there was live music there, we stayed for one and moved on to get to the real Beijing off the main Hutong and we found it. A family run, locals cafe that had pictures of food, laminated menus and a beer that was 8 times cheaper than the one we had in the bar. 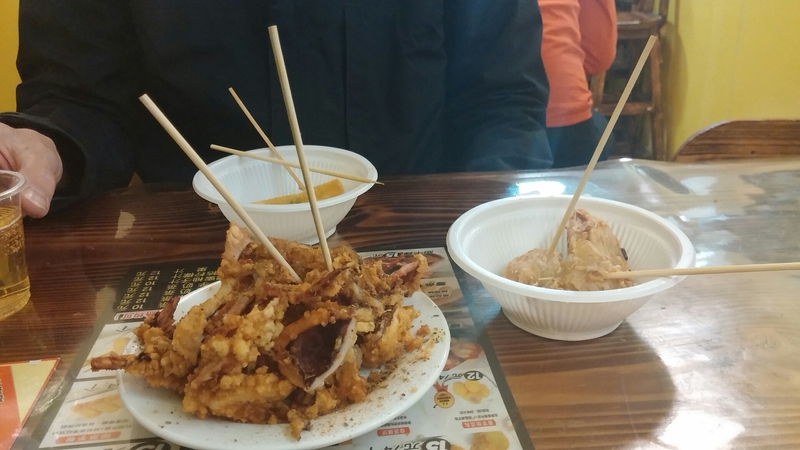 We think we ordered fried durian fruit, fried yam and some delicious squid. Suitably refreshed we made our way to a Craft Ale bar just in the hutongs, it was down some windy back streets but we could hear the noise from a few streets away. 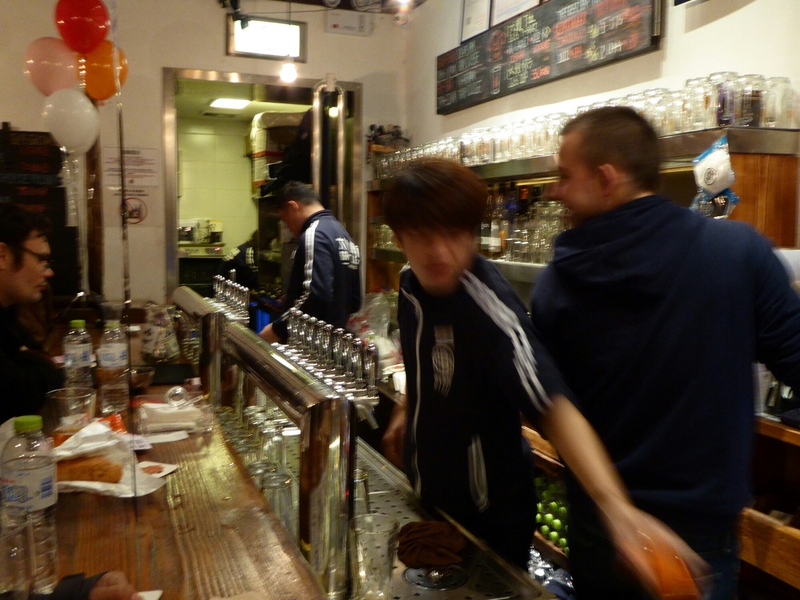 Saturday night in any bar is busy but it was their 6th anniversary so loads of expats were celebrating by drinking all 14 beers on the menu in their 3 bars. Once that was achieved you got a t shirt and round of applause from everyone in the bar. As we arrived about 9pm a few people were finishing their 14 beers and had a habit of standing on chairs/ bar stools and taking of shirts (men only) so it was quite precarious as the alcohol content was perilously high so we prevented a few accidents from happening (even got a free beer from a very grateful girlfriend for preventing her chap from falling head first off a chair). We chatted to a few expats who had been drinking since 11.30am and were looking surprisingly focused despite that. We called it a day and having missed the last tube, we walked home drunkenly enthusing about Asia and its overwhelming affect on your senses. Wake up to gently rolling hillsides which then turned into huge jutting cliffs with trees and foliage clinging to them. Every little space is taken up with agriculture of some kind. Many plants I recognise, a lot of sweetcorn, different berries, grape vines (maybe for the raisins we bought in Mongolia which were from China) all grown in tiny plots inbetween the steep jutting rocks, it is very different to the huge expanse of fields we saw being cultivated in Mongolia and Russia. The scenery is stunning even when shrouded in grey cloud and drizzle. Our train carried on through the many tunnels that were carved into the rockface. We were due to arrive in Beijing at 11.50 and for the first time on our trip we were late!!! About 20mins late. So after 42 days on the road, 14 trains, 2 ferries, 3 buses, 6 metro rides, 3 taxis and a lot of walking later we finally arrive at our Trans Mongolian destination. Some people would take a plane and do it in 7 hours but they are wrong, slow travel is the way to go. We got off the train and smoothly transitioned onto the platform, revelling in the luxury of a same level platform instead of the perilous decents onto other platforms previously. We then had another luxury of escalators! Ooooh how excited were we?? The modern world is fabulous. We have spent weeks watching people with trolley bags, elderly relatives in wheelchairs, Americans with 3 huge suitcases each stop abruptly when getting off a train and realising they have to lug their luggage/relative up/ down a massive load of stairs. Whilst revelling in the convenience of China we entered the train station square and our senses were assaulted, firstly the noise, loud speakers everywhere shouting at you, the smell of Chinese food (although worryingly Melody said she only smelt dirt) and bright neon lights and lots and lots of people, everywhere. We needed to get money to get on the subway. The convenience of China faded there was not an ATM insight. We wandered around the massive square then spotted a bank over a 6 lane road so clambered up the overpass, past the old lady begging (who had enough yuan for our journey) and down the other side where we bumped into a couple from the hostel whose cards didn’t work in the bank we were heading for. We commiserated with them and kept our fingers crossed when we tried the machine. It worked for us!! Yuan’ed up we crossed back over the overpass, met some other westerners whose bank cards didn’t work and commiserated with them and started our queuing life in China. One queue to get a ticket, next queue to get into the subway station through the security checks which means putting packs through x ray machines whilst no one actually looks at what is going through the machine. Not pointless in the least. We successfully navigated the subway system which, although is massive is really easy to follow signs and coloured lines, and got to our hostel easily. We were welcomed by a very smiley Candice, who knew who we were and was expecting us! We are back in Asia where all backpackers have cafes and bars (with happy hours) and a variety of tours on offer (noting the Tibet tour had a massive black cross over it.) It is nice to be back. Our room has ensuite and damp, we were only expecting ensuite. We needed to do washing and laundry is a service offered, 20 Yuan per kilo, which we didn’t really think through as we dropped off 8 kilos of washing and had to pay £20 for!!!!! Well and truly scammed. 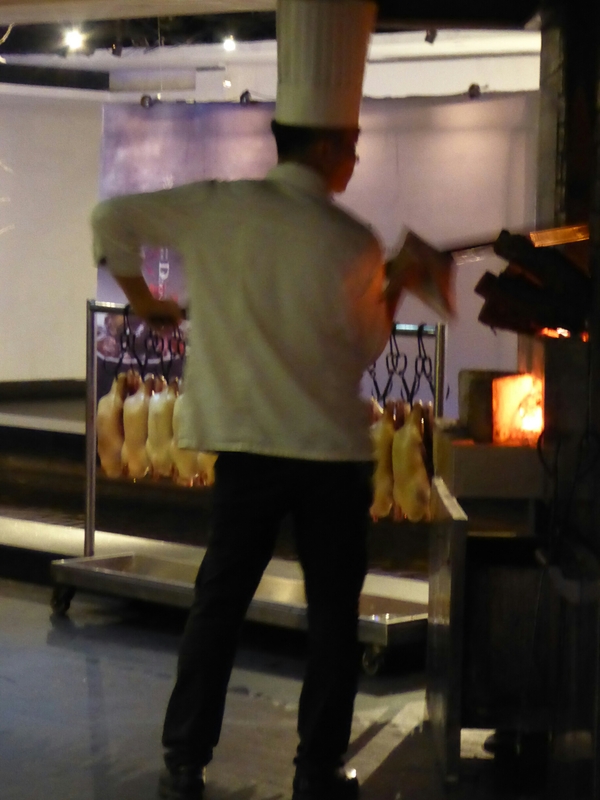 As we were leaking money we decided to carry on and go for Peking Duck at a swanky restaurant, using up the rest of Guy’s birthday money from the in-laws. As it looked like a posh place we showered and put on fresh clobber. 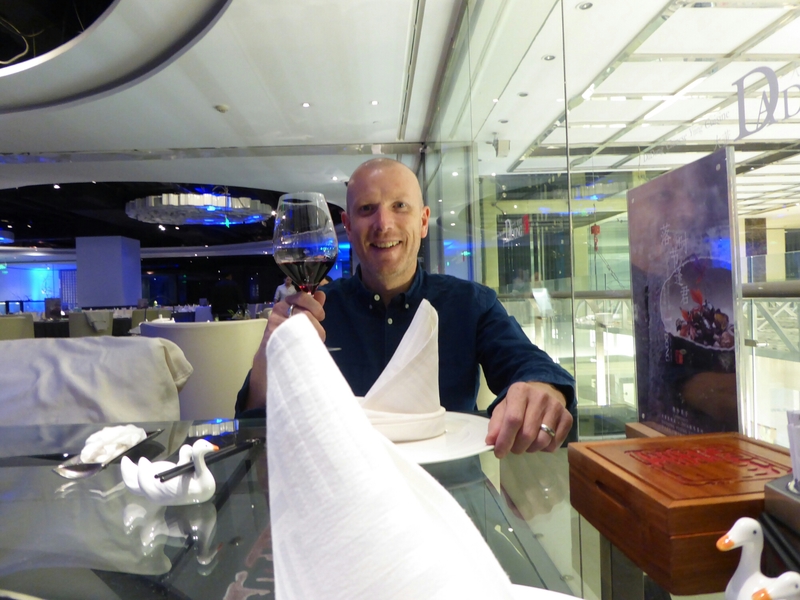 It was another world, table cloths, glassware, fancy chopstick holders, and waitresses. We ordered our duck and also some green vegetable dishes (as a treat) and a bottle of house red!!!! And finally a bottle of still water that turned up on the bill as costing £10, half the price of our washing. 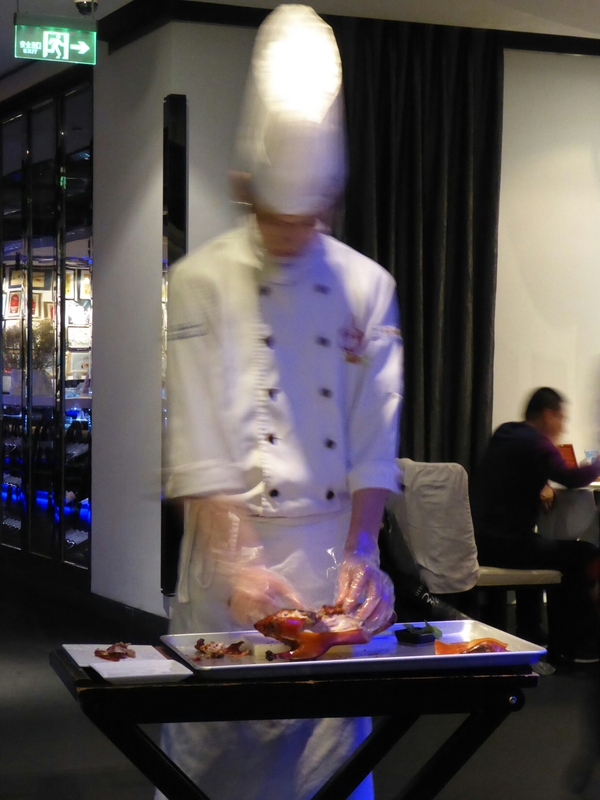 The duck was carved at your table in the most delicate fashion and I preceded to roll pancakes and eat it all using chopsticks without dropping anything down my clean white (ish) shirt. We noticed another couple from the train were in the restaurant and exchanged hello (they hadn’t changed clothes though!). Suitably full were went back outside into the grey skies and drizzle and had a wander back to our hostel for happy hour and met a Korean lass we had previously met in Teralji and also on the train and a young fresh Dutch kid who was on his first nights travelling! Ahhhh, bless. Up before dawn to get to train station. We get there before the train will let anyone on so we sit on the platforming chatting to other travellers, I have never been this sociable this early in the morning. We settle down on the Mongolian train noting that this is the cleanest and plushest train yet, there is even a t.v. for every bunk (albeit they don’t work) . We are joined by a Canadian, Melody, who is our chatty companion for the journey and we watch the steppes of Mongolia pass by whilst getting excited by the upcoming prospect of China. The train is full of backpackers, and even though there were 10 of us who left our hostel to board this train we don’t meet any of them. We do meet some from our previous journey to UB (if you have been to Ulan Baataar then you can call it UB) it is getting to be a small world. I am on nil by mouth still so Guy spends his time eating Bone Soup pot noodle and a particularly spicy cayenne pepper pot noodle along with snacks of peanuts, raisins, and 2 varieties of chocco pie and a mystery pastry we bought that is full of mincemeat type thing. I am fine with this and am stoically silent (kind of). 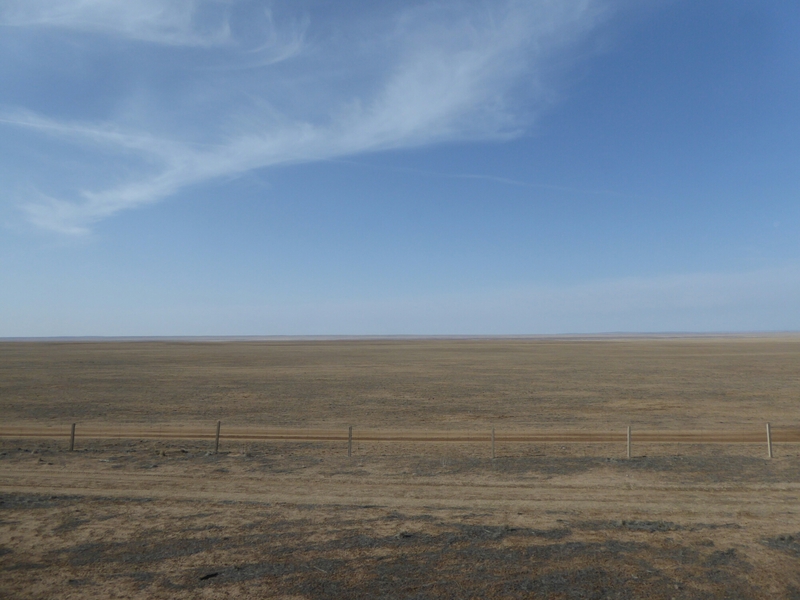 The Gobi desert passes our window however it is not very desert like (photo below for me Mum). We then have a passport border check. On the Mongolian side they are brisk and friendly which we expect from Mongolians now. 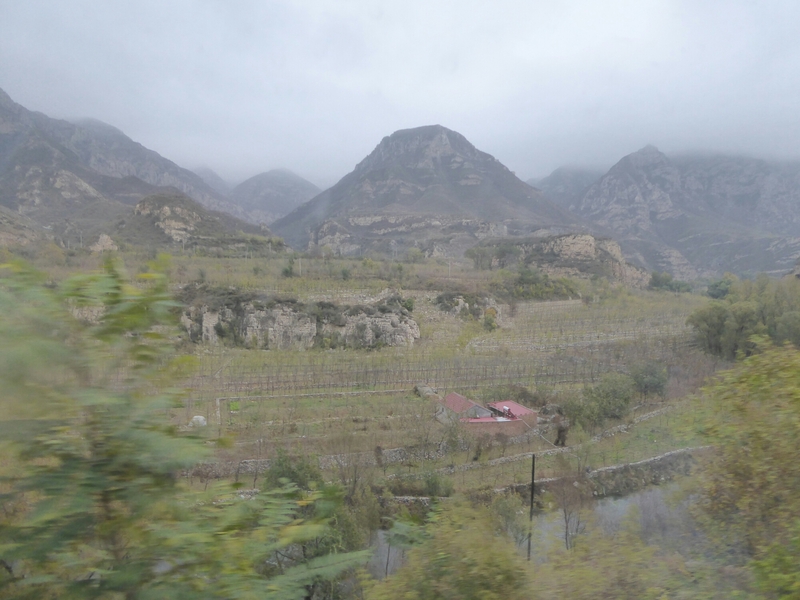 A 30 min train ride through no man’s land and we are in China, it is 7pm, and the first set of border guards are also, to our surprise, friendly, they collect our passports. Another set come through with sniffer dogs and do bag searches. Finally we have a guard with a hand held device that he vaguely shoves in everyone’s direction that we have no idea what it was for, but later find out was probably a heat gun. Good thing it didn’t pick up alcohol heat as Guy had started on the voddy by this stage! Now we need to change bogeys, which sounds wrong to me, but many men are fascinated with this and point their massive camera lenses out the window hoping for a snapshot of a bogey! 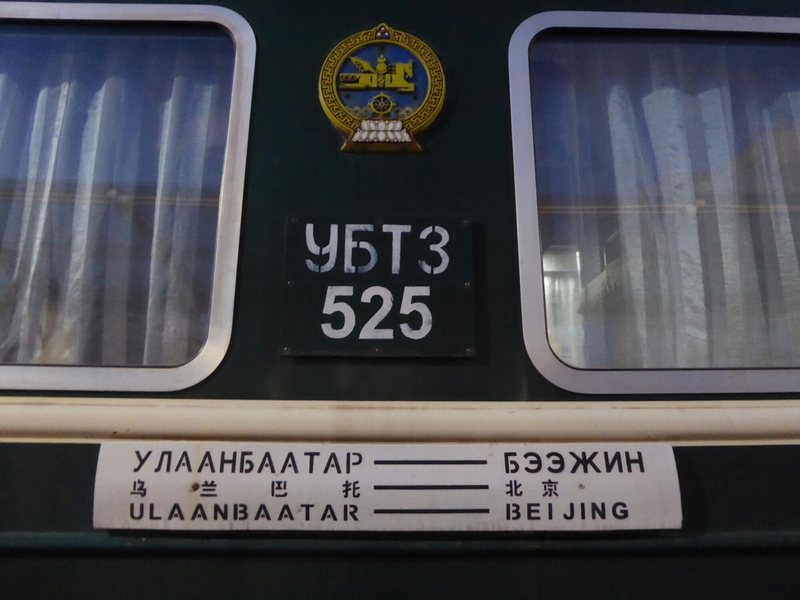 For the unaware changing bogeys in train speak means changing the wheels on a train and involves (in China) 6 hours of being shunted back and forth with lots of clattering and crashing around, so no chance to sleep until past 1pm. Further down our carriage a group on a tour were singing popular songs so we played guess the artist. I lost (only recognising Take that and Soft Cell,wasn’t quick enough for Bon Jovi, Guy beat me to that!!!). By this stage we had an Australian woman and a Japanese/ Canadian in our carriage and a vodka taste test was underway. I sat and watched. We got to bed after 1.30.